There are no hard-and-fast rules for pairing wine with food, but there are some guidelines. 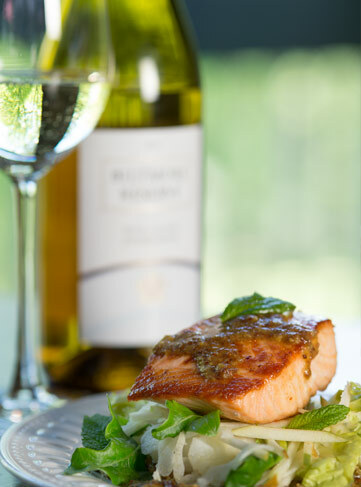 Light-bodied wines generally pair well with lighter food, while fuller-bodied wines complement heartier dishes. Consider, too, the primary flavor of a dish (sweet, sour, salty, bitter), because that will influence your perception of the wine. Always pair desserts and sweet foods with even sweeter wines. The sweetness of the food will diminish the apparent sweetness of the wine, making it taste more tart and tannic. Sour food will enhance the sweetness of a wine, so it’s a great match for crisp whites. Salty food increases the fruity, sweet character of wine and pairs especially well with sparkling wines, acidic whites, and robust reds. Bitter food will increase the bitterness of a wine, so it’s best to pair it with something less complex.